We’ll be discussing this blog post – including your Q&A – during a live Office Hours Hangout at 9a Pacific on Thursday, April 10, 2014. Sign up at http://bit.ly/awsoh! In the first part of this series we’ll introduce our sample application – aMediaManager – and review its infrastructure and application architecture. As part of that review we’ll uncover the other AWS services our application depends on, including RDS, ElastiCache, S3, DynamoDB, etc. We’ll then explore how to use CloudFormation to model and deploy the application with all of these dependencies in EC2 Classic. We’ll leverage embedded CloudFormation stacks to model the application and infrastructure in layers, and explore how to pass all of the configuration information (e.g., database and cache endpoints) to our application. 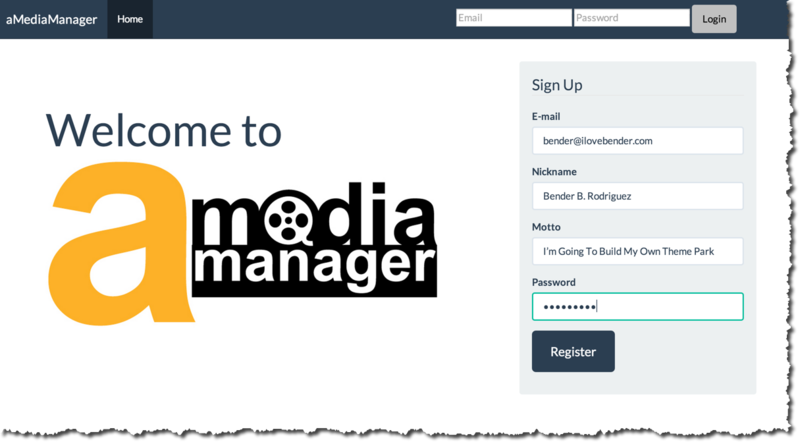 Our sample application – aMediaManager – is a Java web app that allows users to upload, convert, and share videos via a web browser. 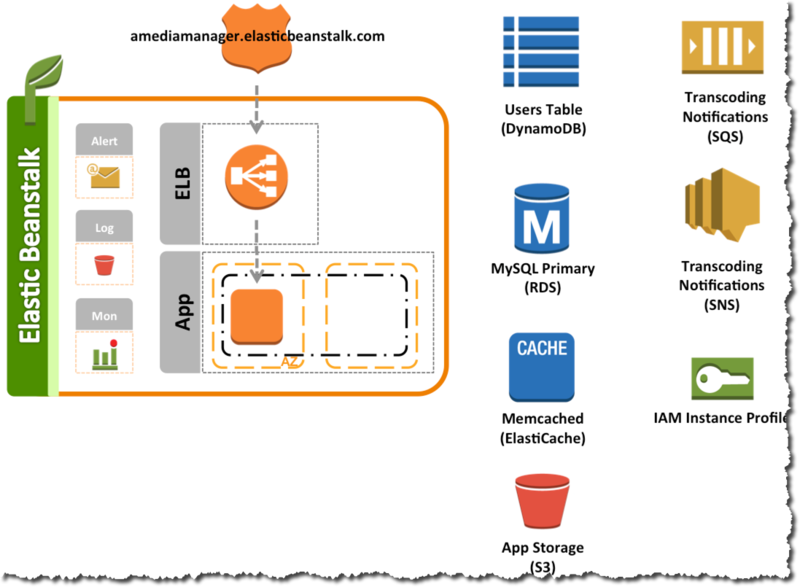 The application stores user authentication and profile information in Amazon DynamoDB. Profile photos are stored in Amazon S3. Videos are uploaded and stored directly to S3, while Elastic Transcoder creates a video thumbnail and creates a streaming version. Video metadata, including tags, is stored in RDS and cached in ElastiCache. 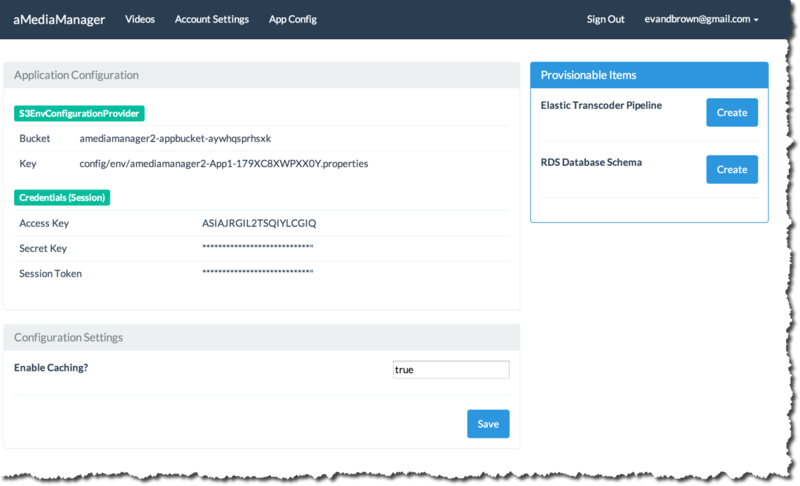 An admin console exists to provision parts of the application that can’t be managed in CloudFormation (i.e., database schema and Elastic Transcoder resources). The console also provides information about the application configuration and AWS credentials being used by the app. The app uses a number of AWS services for data storage, video conversion, security, and messaging, including Amazon S3 for uploaded videos and app logs; Amazon RDS for storing searchable video metadata; Amazon ElastiCache for caching database queries; and Amazon DynamoDB for storing user profile information. Edit cfn/classic/launch-params.json and replace YOUR_EC2_KEY_PAIR with the name of a real EC2 Key Pair in your account. By using CloudFormation templates to declare our application and all of its dependencies, we can quickly deploy the entire stack to any one of 8 Regions around the world. We can also allow developers to run and destroy their own isolated stacks for dev and test purposes, and we can version control our templates and use them to manage changes to stacks. Although we could define model this entire application and all of its dependencies in a single template file, we’ll choose to compose everything into 3 separate templates. amm-master.cfn.json: This is the parent template and it only defines two Resources, both of them embedded CloudFormation stacks. To run the entire application, run this stack. amm-resources.cfn.json: This template defines all of the dependencies for our application, including RDS databse, ElastiCache cluster, DynamoDB table, S3 bucket, IAM roles, etc. It is the first child stack created by amm-master.cfn.json, and it outputs the IDs of everything it creates. Working backwards, this retreives the RdsDbId value from the Outputs section of the AppResources resource. Launching the amm-master.cfn.json template causes the amm-resources.cfn.json template to run, which creates all of the dependencies for our app. When it’s done, we’re finally ready to deploy and run our application code in Elastic Beanstalk. 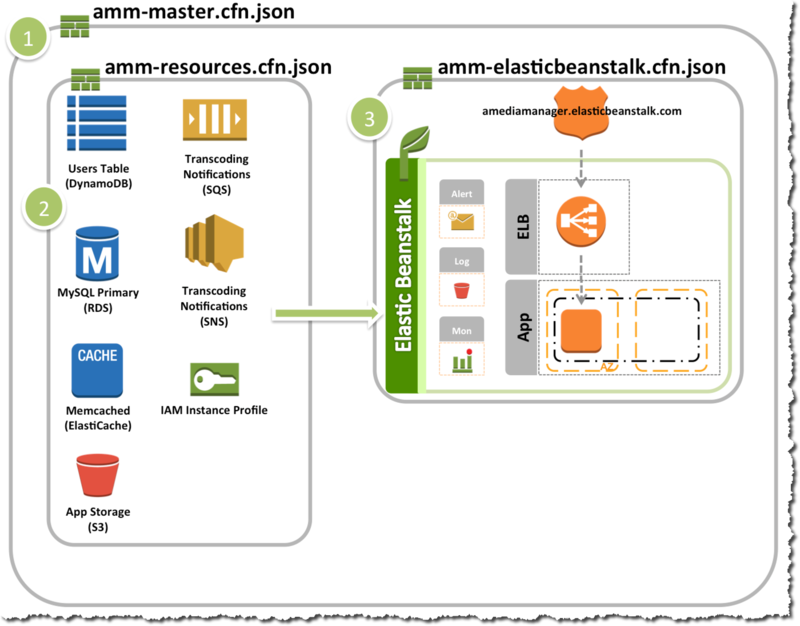 We model and define that Elastic Beanstalk environment in the amm-elasticbeanstalk.cfn.json template file. In Elastic Beanstalk, an Application is a collection of Application Versions (i.e., versions of your code), Configuration Templates, and Environments. An Environment exists within a particular Application and is a running deployment of a specific Application Version, including all of the infrastructure (e.g., EC2, Auto Scaling, ELB, CloudWatch, etc) required to run the app. ConfigurationTemplates: Here we define one template named DefaultConfiguration. This defines configuration settings for an Environment within the Application. You’ll also notice that in addition to specifying the DefaultConfiguration as the ConfigurationTemplate, we’ve also defined explicit OptionSettings for this environment. In this case, we’re setting environment variables to the values of the resources (e.g., database, cache cluster) created in the amm-resources.cfn.json template and passed in via parameters. It’s important to note that option settings defined directly on an environment are specific to that environment (i.e., they’re not part of a configuraiton template). In the upcoming Part 3 of this series, we’ll talk explicitly about why we made this choice (hint: it has to do with how we handle application configuration in a centralized fashion). After you deploy the amm-master.cfn.json stack and it completes, head on over to the CloudFormation Management Console to checkout the result. But what about that 4th stack that I didn’t annotate? The Elastic Beanstalk service has chosen to use CloudFormation as its engine: when you use Elastic Beanstalk to launch an Environment, it ultimately builds a CloudFormation template and uses it to provision your enviornment. This is an Elastic Beanstalk implementation detail; you can (and should) ignore this stack and use the Elastic Beanstalk APIs directly to manage your application and environment. If you want to play around with the app and upload videos, you’ll need to click the App Config link in the menu bar, then click the Create buttons to provision the Elastic Transcoder Pipeline and Database Schema resources. We’ll talk more about what’s happening here in Parts 3 and 4 of the series. We’ll also focus a lot more on the internals of the application in Parts 3–5 of this series. In the first 2 parts we’re really focused on the provisioning and management of the infra required to runt the app. We’ve committed to using CloudFormation, and the work we put into building the templates will start paying returns in short order. Let’s take a look at a few scenarios where CloudFormation makes it simple yet predictable to manage our application and its infrastructure. Let’s assume that what we’ve provisioned in this blog post is our dev/test environment. The Elastic Beanstalk Application and Environment we provisioned was for Henry. Lucy just joined the team, and she’d like her own space to deploy her branches of the code base. For cost and efficiency reasons, we’d like her and other devs to share the supporting resources (i.e., database, memcached, DynamoDB, etc), but give them their own Elastic Beanstalk Application and Environment. 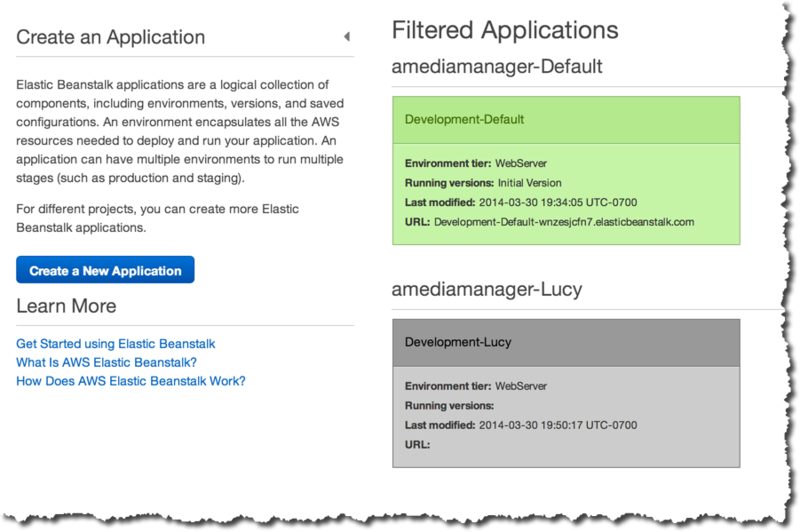 $> git commit -am "Adding an Elastic Beanstalk App and Env for Lucy"
One of our developers would like to connect MySQL Workbench from his laptop to the test RDS database to run a few ad-hoc queries. We’ve disallowed this by default (instead only allowing EC2 Instances in our Elastic Beanstalk Environment to connect), but we can use the same ‘modify template/commit/update’ workflow to allow this. This condition evaluates to false (i.e., disallow Remote DB Access) if the param value is 1.1.1.1/1. Otherwise it evaluates to true. In a nutshell, if we set the RemoteDBAccessSource to a valid CIDR that is not 1.1.1.1/1, the DBSecurityGroupRemoteAccess resource will be created, allowing access from that IP. I could also do the update stack workflow from the CloudFormation Management Console. As we mentioned earlier, running this stack and application creates real AWS resources that will cost money if left on. First, don’t forget to join us for the live Office Hours Hangout later this week (or view the recording if it’s past April 10 2014 and you don’t have a time machine). In Part 2 of this series (blog post and Office Hours links forthcoming at http://blogs.aws.amazon.com/application-management) we’ll take everything we learned in Part 1 and use it to provision a VPC and deploy our app and resources into that VPC. We’ll also dive into building and managing templates for multi-region deployments (i.e., the very thing that allowed us to deploy that stack to Tokyo in the last scenario.) Please join us next time for more!